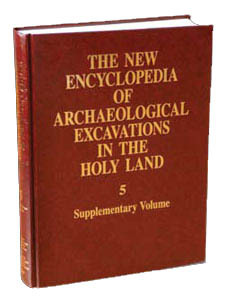 Excavations were conducted at Tel Nami in 1992 and in a shorter season in 1997, both under the direction of M. Artzy. It became clear in 1992 that Nami East, 100 m east of the tell, was mainly a Middle Bronze Age IIA site, into which Late Bronze Age IIB graves had penetrated. The graves reused stones from the Middle Bronze Age buildings, some of which were of monumental size, their walls standing to a height of well over 1 m. A built grave of the Middle Bronze Age IIA was uncovered in this area; in it were found various ceramics including an Amuq/Cilician jug and Levantine painted wares. Additional graves from the Late Bronze Age IIB were encountered but partially disturbed by modern military activity. One, a new type of built tomb, included collared-rim jar burials. Unfortunately, the roof was destroyed, but a hollow stone on its southern wall could well have been used for the pouring of libations. Among the finds from the tomb were a large bronze lamp, bronze knives, and gold and silver jewelry, including fragments of silver and gold diadems. The ceramics included an imported Mycenean IIIB stirrup jar. In 1997, it was established that there were at least two phases of the Middle Bronze Age IIA at Nami East, similar to those in area D on the tell; a ground-penetrating radar survey carried out in the area of Nami East indicated that the site extends at least 100 m from north to south.